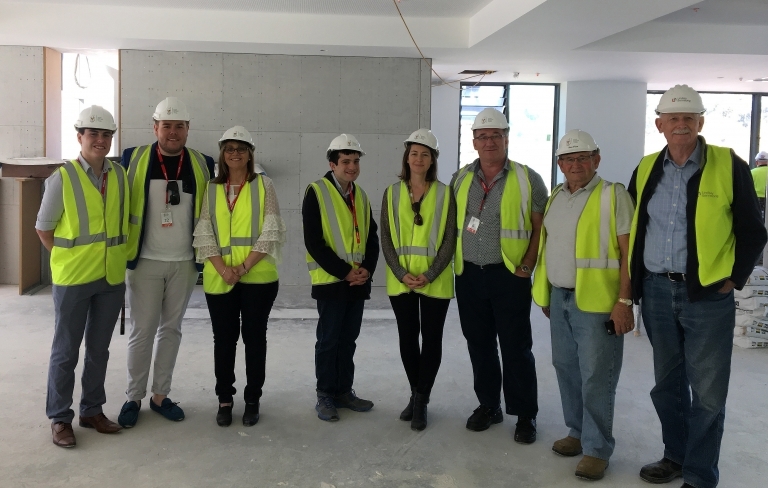 Garton Group McDonald’s have become the first room sponsor to visit the site of the new, 60-room Ronald McDonald House Westmead and select their room ahead of the House’s official opening in 2018. Along with a financial contribution from the business, members of the Garton Group team also chose to set up salary sacrifices to make direct, personal donations to help raise the total amount for room sponsorship. Licensee Ian Garton along with staff members Samuel Tiberi, Liam Holmes, Nola Clague and Matthew Atkins toured the site in September, making the choice to sponsor a fully-accessible self-contained ground floor unit, which will allow for families to stay together in the House even when a child is at risk from interacting with other families, or where wheelchair access is required. “The Garton Group is honoured to be able to sponsor a room in the new Westmead House,” Licensee Ian Garton said. Room sponsorship invites corporate groups to adopt and name a room for a year and help cover the operational costs to ensure that the doors of Ronald McDonald House Westmead can stay open for the seriously ill children and their families who need accommodation while they receive vital hospital treatments. It’s also a partnership, where room sponsors can engage with the House by participating in network events, hosting meetings in the House boardroom, or donating time and volunteering. Over the coming months, room sponsors will be invited to place their mark on the plans for the new Ronald McDonald House Westmead and officially claim “their” room in the House.